I agree that we are some way off this being practical, but there is nothing fundamentally stopping it working on water. I don't believe that any of the AC50s or AC75s have been publically shown to achieve sufficient VMG downwind to achieve the claimed speeds, but presumably Artemis ran the numbers before making this video so it must be doable. . . . . sails don't spin . . . .
...Velocity, on the other hand, has two dimensions: speed and direction. Given a wind velocity of say 10kn S, then going "faster than the wind" means having a velocity in the S direction with a speed greater than 10kn. In sailing terms, it means a VMG to the leeward mark greater than the windspeed, where the leeward mark is an infinite distance away, or directly S of the boat. I have just looked again at the video from Artemis Technologies and I now realise that their claim could be interpreted in different ways. The video commentary claims that with a flat calm and 10mph contrary river current their boat could, in their words, 'sail back up the river at 30mph'. When Dave Culp, vice chairman of the Amateur Yacht Research Society, saw the video he sent a post to the AYRS forum with the title "AC50 catamaran will do 20mph SOG against a 10mph tide in zero wind? ", the question mark indicating that he thought this was what Artemis were claiming and wanted to know if it is realistic. Leaving aside the point that the Artemis boat is not actually an AC50 catamaran, I did answer his question as best I could based on known performance for similar style yachts together with a simple back of an envelope vector diagram - see the link to my previous post to this topic here above. I did express skepticism regarding the claim! I think that the average 'man in the street' who does not know about the effect of current on boats or about tacking downwind would take 'sail back up the river at 30mph' to mean that if the river is straight and there are two locations on the river that are 30 miles apart the boat could get from one location to the other in one hour in conditions when smoke from fires on shore rises straight upwards. That I think is optimistic! A motor boat would need to make 40mph through the water to do that. A sailing boat such as an F50 would need to be tacking otherwise it would simply drift seawards at something a bit less than 10mph. So, depending on tacking angle, it would need to make significantly more than 40mph speed through the water, quite possibly something towards 60mph. As I suggested in my post linked above, I can just about imagine that an F50, being an improvement on an AC50, might perhaps reach a speed through the water in the region of 50knots, but thats still probably not enough, and the idea that such speeds could be achieved with, in effect, a tail wind of only 10mph definitely seems unrealistic. We could do with a verified polar chart of boat speed against course to the wind for an F50 sailing with 10 knots true wind speed. Just a glance at such a chart would tell us all we want to know - I don't suppose anyone here happens to have a chart like that do they? There is perhaps another way the Artemis claim might be interpreted (at a stretch!). The words 'sail back up the river at 30mph' could mean 30mph boat speed through the water, whilst the 'back up the river' bit could simply mean making some progress in that direction, at some unspecified rate. The boat could be whizzing back and forth almost perpendicular to the course of the river at 30mph speed through the water while making ground up river at say 0.0001 mph. To achieve that the boat would need to be capable of 3 times wind speed with 10mph true wind at an angle, according to my trigonometry, about 19.5 degrees aft of the beam, probably not far off the optimum angle for this kind of yacht to achieve its best boat speed. So that's not quite as improbable as the scenario I discussed above. An AC72 yacht is reported to have achieved 44.15 knots boat speed with 15.8 knot true wind speed, a boat speed to wind speed ratio of 2.79. One can well believe that the developments that have lead from the AC72 to the AC50 and now on to the F50 may well have made some improvement in the ratio of boat speed to wind speed. Thanks Tom, that's the sort of data that I can believe. It would be good to have some scientifically rigorous data though, in particular measuring the true wind on the boat and the boat's VMG in the direction the wind is blowing (which should be available from instruments on the boat and combining GPS tracks and apparent wind measurements, ignoring currents). However, I still have not seen any proof of a sailing boat sailing directly down wind faster than the wind. There are propeller/turbine driven boats and land vehicles, but they work on very different principles to sails. None of these excellent posts answers my main objection. This is that the Artemis boat is supposed to sail upstream, powered by a wind created by its own forward movement. This movement itself is initially created by drifting downstream. In this condition, the river flow is actually powering the boat. Whether the boat is drifting downstream at 10 mph or sitting still, with a 10 mph breeze acting on it, the effect on the sail is the same. I would not be surprised if the boat sailed across the river faster than the current was taking it downstream. But once you remove the river current dragging the sail through or across the air, you remove the power source. Even though the boat might be able to progress upstream a little, the apparent wind driving it will quickly run out. This is because now there is no new energy being pumped into the system. But there is a lot more drag. First, we have the drag of the boat going through the water at a higher relative speed. Then you have the natural drag of the wing going through the air. In the treadmill example, this would be like turning off the treadmill and expecting the little windmill car to keep going. None of these excellent posts answers my main objection...... This is because now there is no new energy being pumped into the system. The key thing to realise is that the current is still flowing, and so there is still a difference in velocity between water and air. The fact that the boat is moving relative to both does not stop it extracting work (energy) from this velocity difference. Consider a situation where the boat has borne away to a heading of 45 degrees from dead upstream, and its speed is just right to allow it to match the current (VMG upstream = current). It will appear to a watcher on the bank to be moving across the river, and therefore will be experiencing an apparent wind 45 degrees off its bow, at a speed equal to its sideways movement (~= current speed if we ignore leeway). If it now trims the sails slightly better it will start to move faster, resulting in a gradual creep upstream relative to the land. It will also be moving across the river slightly faster, so the apparent wind will be stronger (and slightly more on the nose). If the helmsman bears away (heads more up-river) then VMG upstream will go up. If you accept that a boat can have VMG to leeward faster than windspeed (e.g. for stationary water, 10kt true wind), and you further accept that movement of the reference frame relative to land is irrelevant (because the boat does not interact with land in any way) then it follows that the boat can move up-current in 0kt ground-wind. Whether this particular boat can achieve the speeds stated in the video is up for debate, but that it is fundamentally possible is not. Doug Lord and Doug Halsey like this. tlouth7 is exactly right about the theory & hopefully he has convinced most of the doubters. We would all like to see hard data, of course, but that's not easy to come by. True wind speed & direction cannot be directly measured from a boat that's moving, and very few boats have the computers onboard that would be needed to compute them. Even if they did, questions could still remain about the variation of the wind with height above the surface. In the absence of hard data, I'm presenting some soft data. The plot below shows boat speeds & headings for one session of Moth sailing, with a recreational sailor (me) at the helm. The maximum gust of wind measured from a weather station on the shore of the small bay during the time I was sailing was 16mph, which equals about 13.8 knots. Intriguing diagram Doug, I would be interested to hear more about how the data was obtained. When you say boat speeds and headings, is that headings relative to the true wind direction or headings from gps? If relative to true wind, do you compute the true wind direction from on-board measurements, or do you have a radio data link to the on-shore weather station that you mention? If the headings are from gps, presumably you aligned the diagram so that the vertical axis is at least approximately aligned with what you think was the mean wind direction? I say this because if you simply plotted the diagram with the gps zero degrees course straight up on the plot and the true wind measured on shore was from 305 degrees, then you must have done a lot of sailing pretty well directly to windward, which I am sure is not the case. I have to say that I have wondered about the accuracy of true wind speeds computed from apparent wind data measured by on board instruments since the proximity of the rig to the wind instruments may significantly affect such measurements. For a boat sailing close to the shore I wonder if a radio data link between the boat and on-shore wind instruments would actually be better, despite the distance between boat and wind instruments. Ideally perhaps you would have a laser anemometer that scans the atmosphere all round the boat, measuring and averaging wind direction and speed over an anulur region that is reasonably close to the boat but not too close. I think I read that America's cup teams use laser anemometers, so perhaps that is indeed what they are doing? Intriguing diagram Doug, I would be interested to hear more about how the data was obtained. The data are almost directly from the text file produced by a Velocitek ProStart (a gps speedometer that is commonly used in Moths & other small boats). Among other things, the file gives the heading & speed at 2 second intervals. You are correct that I have estimated the wind direction from the data & have rotated the plot to orient it in the usual way, with the wind parallel to the vertical axis. (My apologies for the confusion that you point out). The free software GPS Action Replay produces similar plots, which are frequently seen online & in published reports, but with shading that obscures the individual points. I thought it would be more instructive to see the points, so I wrote a simple code to make this sort of plot. The same data plotted in GPS Action Replay is shown below. I don't know how the AC teams collect their wind data, but I doubt if there's any way that they can completely eliminate the uncertainties. I consider myself lucky to have a weather station so close to where I usually sail, but it's still far from ideal. Well looks like this topic has potential to be as epic as the directly downwind faster than the wind threads. It is all about the leverage and speed difference between mediums. And statement quoted aibe is plain false. Landyachts frequently beat the wind “distance made good” by a clear multiple. The ddwfttw cart beat the downwind by over 2x multiple if I recall right. It is a good brain teaser and potentially helps in understanding aerodynamics and sailing dynamics. No magic, no energy creation, no perpetual motion here. 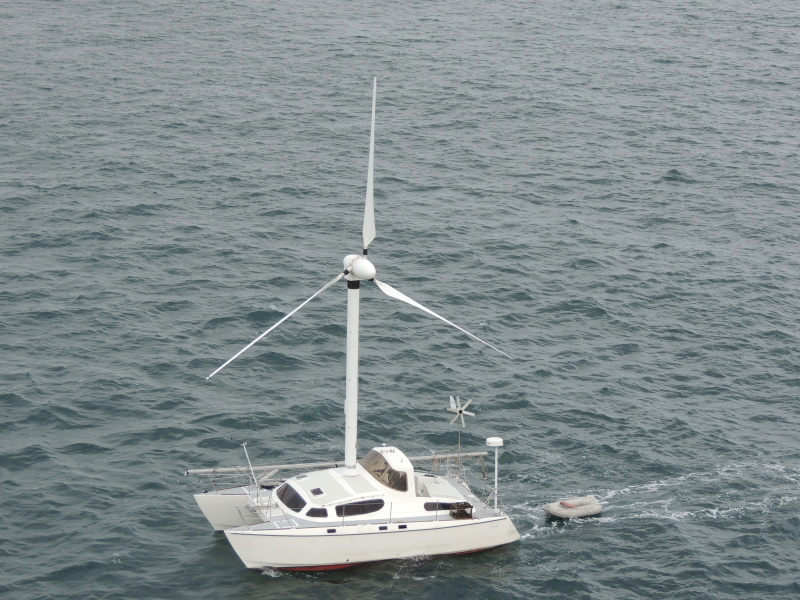 I love that Revelation II (catamaran in post #17) also has a small wind turbine for domestic electricity. I wonder whether they find it best go head straight upwind or to "tack" into the wind for best VMG. I imagine that the drag on the turbine from driving propellers would prevent any beneficial autorotation type effects. Also nice video kerosene, the only problem is that it starts from an assumption that a sailing boat can make VMG downwind greater than windspeed which some here find hard to believe. None of these excellent posts answers my main objection. This is that the Artemis boat is supposed to sail upstream, powered by a wind created by its own forward movement. This movement itself is initially created by drifting downstream. In this condition, the river flow is actually powering the boat. Whether the boat is drifting downstream at 10 mph or sitting still, with a 10 mph breeze acting on it, the effect on the sail is the same. Even though the boat might be able to progress upstream a little, the apparent wind driving it will quickly run out. 1st. the treadmil, no, not the same, if you turn of the treadmil there is no speed difference of 2 mediums. The energy is harvested from that. Now the boat travels with the current to get airflow. Once it has airflow over wings it can control itself and turn upstream, which will INCREASE the apparent speed of waterflow. You have to think the wings (in water) equal to the dilemma as the wings. It is in a sense sailing from the water flow rather than airflow (really both but might help understand). The turbine on water spinning a prop is a decent analogy - we just have to accept that we have only one blade on each and instead of spinning they have constant flow... its about the leverage between those two. Now even more weird phenomenon. An RC glider reaching 500 (!) mph in much slower speed winds. There is a good presentation by the record creator about the phenomenon, also used by albatross birds gliding in and out of wind between wave tips - dynamic soaring. Even in those examples the energy is taken from smaller speed differences between two mediums (more and less wind) and "geared" with high efficiency to much higher speeds (or "free" energy for the bird).